The famous aria from the St Matthew Passion which we might reasonably expect on a disc with this title and devoted to the music of Bach is not to be found here. Neither is the Chorale Prelude on Wir glauben all an einen Gott from the Clavierübung III. This latter is, however, advertised on the outer cover, the track listing in the booklet and described in some detail in the booklet notes. Its whereabouts is a mystery. It most certainly cannot be found anywhere on this disc, and where it is billed as appearing (track 9) we have an anonymous organ chorale on Herr Christ, der ein’ge Gottessohn which is most certainly not by Bach. Other items are as they claim to be, including Benjamin Alard’s brisk and no-nonsense approach to two genuine Bach organ chorales, Herr Christ, der ein’ge Gottessohn from Das Orgelbüchlein and the juvenile Erbarm dich Mein, O Herre Gott which, sadly, lacks both charm and elegance in this somewhat harshly angular account. Other purely instrumental numbers involve flautist Anna Besson who puts an unashamedly self-indulgent gloss on the Sarabande from the unaccompanied A minor Flute Partita. The three members of A Nocte Temporis work best as an ensemble, playing off each other’s strengths and infusing everything with a vivid sense of style. This is convincingly proven in a delightfully-paced account of a movement from the Flute Sonata BWV1034. 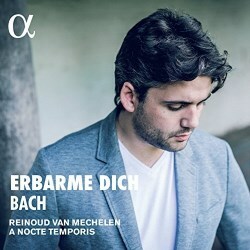 Founded last year by the Belgian tenor, Reinoud van Mechelen, A Nocte Temporis seems to exist primarily to showcase his voice, and there is a feeling that this CD is more in the nature of a souvenir for a forthcoming promotional tour than a coherently-programmed CD for the armchair public. It follows a programme which would seem tailored around the demands of a live show – even distribution of material around the players overriding any clear sense of thematic coherence, moments of repose for Van Mechelen factored into the hour’s playing time when, in a live show, he would presumably grasp the plastic bottle of water and give it a healthy swig. As a purely auditory experience, while I love the quality of the music making, I am not at all sure this disc of short Bachian numbers really works. Van Mechelen makes a little too much of a meal of the words in the simple statement of the chorale Herr Christ, der ein’ge Gottessohn – and it seems perverse to include this as a solo item when it would surely have been more appropriate to present this simple four-part section as an organ solo. The somewhat stylized sombreness of the central movement from the G major Sonata BWV1039 comes across as simply dreary here, the duet between real flute and organ flute not quite as intriguing as it may seem in a live setting with its spatial context. However, there is no denying the fact that Van Mechelen possesses a beautifully clear, precise and mellifluous voice, and it suits this repertory to a tee. Cards are laid out on the table with the very first item (one of two arias taken from the cantata Herr Christ, der Ein’ge Gottessohn BWV96). A bright and flowing flute from Anna Besson supported by the crisply articulated cello of Ronan Kernoa and a neatly defined organ continuo from Benjamin Alard effectively envelope Van Mechelen’s agile vocal line to create not so much an accompanied aria as a true quartet of equals. Among the other similarly uplifting tracks are a gloriously effervescent Lass, O Fürst der Cherubinen from the cantata Herr Gott, dich loben alle wir BWV130 which has a wonderfully angelic radiance to it. While it is the lightness and agility of Van Mechelen’s voice which impresses most, he can add a touch of drama (as in the recitative from the cantata Ich armer Mensch, Ich Sündenknecht BWV55) and can ooze pathos (as with the tantalizing chromatic slides of the closing aria, which gives its name to the disc). Perhaps best of all is the aria from the cantata Jesu, der du meine Seele (BWV78) where all four musicians seem in absolutely total unity of approach and style.